Given that combining music creation and exercise may improve motivation to exercise and lead to health benefits, the goal was to design music making devices for older exercisers. I observed and participated in several “Gold Club” fitness classes at the Dovercourt Recreation Centre. Common themes noticed were that many individuals had limitations with balance, flexibility, and range of motion. In addition, some could become easily lost in the steps of the exercise due to either unfamiliarity or missed timing. Thus, my focus on this project was on the balance aspect and creating a musical exercise device to address this issue. We invited the older exercisers to work with us in co-designing our devices. They were enthusiastic about the concepts and contributed ideas that were suitable for them. These provided a foundation for designs, which evolved over the course of 8 months. Interestingly, by combining music-making with exercise equipment, the potential for new exercise routines also emerged. As a result of all of this, I created a balancing exercise instrument to improve older adults’ balance for preventing fall injuries and placing an emphasis on music, synchronicity, creativty and social interaction. As the instructor and participants are on the board, the instructor chooses a song to be played on all of the boards. If the participants fail to mimic the actions performed by the instructor, the song being played sounds muffled and the board vibrates to give the user feedback that they are not staying in sync. This instrument makes fitness classes more enjoyable and adds variety to balance activities. Many Thanks to: Dovercourt Community Centre and Gold Club Members; to Professor Jesse Stewart and Professor Adrian Chan; Pat Bierne; as well as David Popovich. Co-design is a concept generation technique that aids the design process in many ways. This technique is beneficial because it brings the people who are using the product or service into the design process to create something they want. The designer is acting as a facilitator instead of guessing what people want. As a result, there is less room for misinterpretation and miscommunication. These concepts will be used as a stepping stone for the workshop to ensure that they move efficiently in the correct direction. This was divided into three sections: PRE CO-DESIGN, CO-DESIGN, and POST CO-DESIGN. 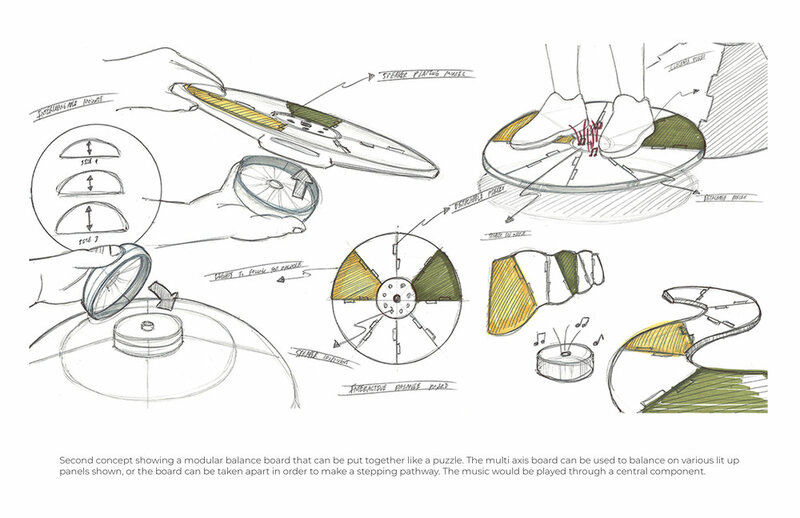 One can see the initial CAD model created for the multi-axis, modular balance board. This board utilizes a puzzle-piece formation to place the panels together and then onto a ribbed frame. Each of these panel pieces has an LED in it that would flash a particular colour and the user would have to reposition their feet onto the colors shown. The middle component is a speaker, and also holds the interface system for the device. One can see the CAD model created for the multi-axis, modular balance board. This board utilizes a skeleton-like formation to place individual panel pieces in. Each of these panel pieces has vibration sensors in it to provide feedback for the user when they are not in sync with the instructor. The middle component is a speaker, and also holds the interface system for the device. One can see the context shot of the multi-axis, modular balance board displaying both settings. One displays “on-board” balancing exercises, where the user has to follow the instructors actions, and if they fail to stay in sync with their movement, the music will distort. The other displays the “off-board”, stepping-based exercises, where the user must also follow the instructors actions or the music would distort as well. The instructor of the fitness class controls the rhythm and movement. As the song plays, the participants need to match the instructors movement on the board. If they fail to mimic the movement, the synced song on their board will run a low pass filter. These exercises can be done while standing or they can be achieved with the participants having their hands on the pads. The filters that run through the songs are meant to be a positive, yet negative feedback. 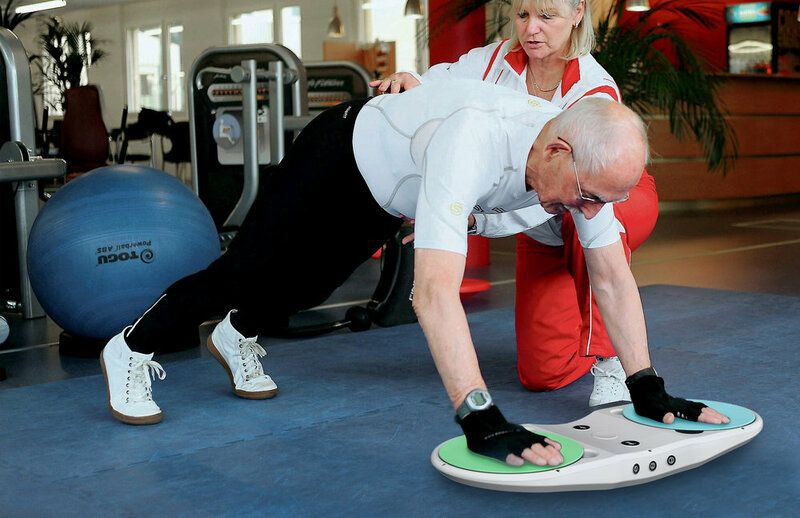 The coloured pads can be taken off in order to focus on balance in stretching exercises or stationary stepping-based exercises. The instructor would perform the various moves and the participants would have to follow with their hands or feet. The same type of filter would be used for this off-board setting. Showing the various details of the Harmony board. Top button is for the "On-board" option. Bottom button is for the "Off-board" option. Sync button, power button, mini USB charging port, and bluetooth button. These buttons are for the height adjustment levels. These are the increments that are shown for the height adjustment levels. Level 1 is the standard height, Level 2 is 5 mm, Level 3 is 10 mm. 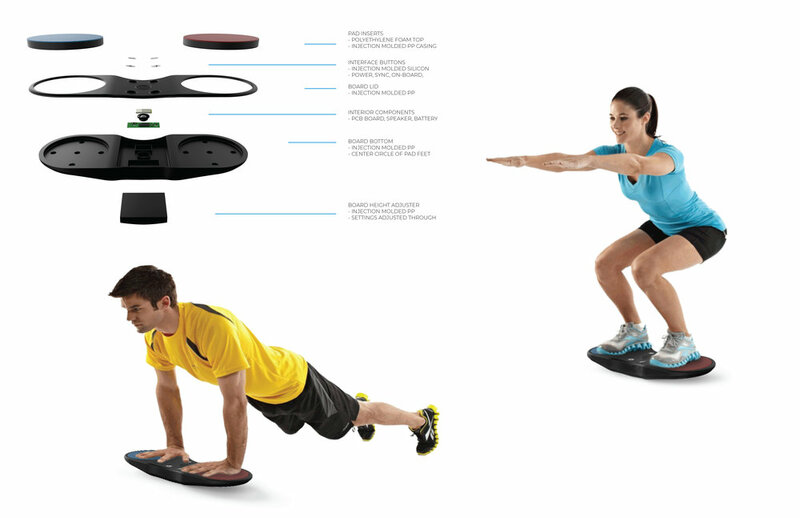 If the user is intimidated by the height of the board, or the board itself, they have the option of using the black foam inserts as "training wheels" to ease them into the exercises. This is the storage-charging platform for the Harmony boards. There are 8 mini USBs on the tabletop, and space under to store the inserts. This image outlines the details of the storage platform as well as the foam inserts that are used for the Harmony board. This was a 1:1 scale prototype that was completed. All of the components, with the exception of the fitness foam on the pads, were 3D printed. The total time with printing surpassed 100 hours.